How fished: For stripers, hooked through the lips on weighted (often fish-finder) rigs from anchored or drifting boats or trolled slowly; cobia fishermen like to sight-cast them directly to cobia on top Comments: Slimy, squirmy live eels almost defy handling; most anglers either use sand to get a grip or put eels on ice to make them temporarily lethargic. Voung eels live and feed in fresh water for 10 to 20 or more years before they become adults and return to the sea. Habitat: Tide rips, particularly in the vicinity of sand banks How caught: Mostly with small sabikis Local importance: Off Hampshire/Devon/ Cornwall/Wales and the Channel Islands Target game fish: European bass, pollock, turbot and brill, occasionally tope How fished: Usually on a long, flowing trace from a boat drifting oyer sand banks, through tide rips or over wrecks. Smaller eels are rigged with single hook near the mouth; two hooks fished in tandem are used for larger baits, the front hook near the head and the rear hook positioned just behind the dorsal. What Makes a Good Livewell System? While the acrylic lid on this livewell is rectangular, the fan ft below it is oval. The large opening allows captains to quickly dump baits from net to well. 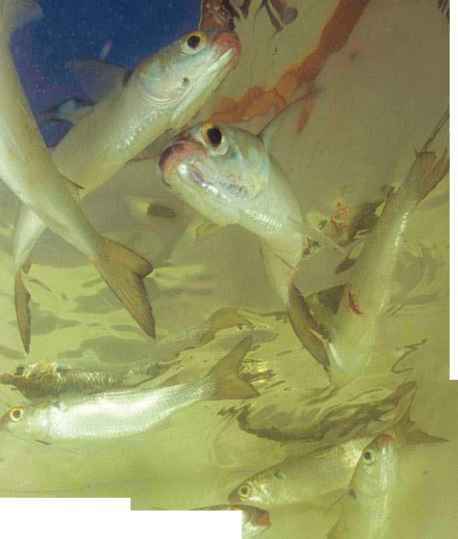 stagnates, baitfish quickly suffer stress and die. Mosi boatbuilders and ii ve we 11 manufacturers achieve good flow in similar though slightly different ways. We asked a California bait-tank maker and representatives from three boat companies — Hatteras (sport-fisherman ), SeaVee (center-console offshore) and Yellowfin (center-console offshore and bay) — to tell us how they design their Weils. ''The most important thing is the volume of water," says Ralph Torres, co-owner and vice president of SeaVee Boats in Miami — a hot spot for live-bait tourney fishing. "A typical 60-gallon i? well should be plumbed § with at least an 1,100 gph s pump," though preferably t> two pumps per well should | be used both for backup or When more wrater is wanted, he says. What's the most crucial feature a livewell system should have? A half-dozen experts we asked say fresh water flow. Not blue interior paint, LED lights, oxygenation systems or acrylic windows — although all of those may offer legitimate benefits, particularly to tournament anglers searching for any edge. But if a livewell's water into a vessel's bilge and houses the pumps, which are kept submerged in cool water — designed to make them last longer. In a single-pump, 60-gallon system, a complete load of fresh water flushes through the well every three-plus minutes. Twenty minutes should be the bare-minimum turnover time, Torres says, adding "and the size of the drainage needs to lie adequate to maintain that flow." What goes in must go out, which means the diameter (wide) and length (short) of the overflow hoses is critical. Mark Wisch of Pacific Edge Tackle in Huntington Beach, California, builds bait tanks for Pacific live-baiters. He uses a six- to 10-minute turnover rate as average. I le advocates building lower, flatter wells rather tlian tall, cylindrical ones, saying the bait can better mil! alxxit in squatter wells. Shape is often determined more by the hull design than anything else, however. But all wells should be rounded or oval, the experts say. Baitfish damage themselves if forced to swim into corners. Yellowfin Yachts uses a similar design even for its bay boats, using a pickup flush to the hull bottom covered by a grate, says Yellow-fin vice president Kevin Barker. The grate helps keep grass from shallow-water habitats from entering the well, eliminating the need for a filter, Tournament anglers, however, often install filter systems to further purify the system. 11 le water flowing into the Well should create circulation. But Irait should swim gently into the cunent, not Struggle against it. To ease flow, some manufacturers bring water into the well in multiple locations. Torres says SeaVee brings water into the tank near the bottom and points flow both sideways and down. "I've heard comments from some of the captains that they prefer to see a clockwise flow- of water inside the well," Torres says. "That creates the same scenario of flow [inside the tankl as the rotation of the earth [creates in the ocean] in this hemisphere." Redundancy is another factor important to dedicated live-baiters. Donahue says Hatteras commonly uses powerful 1,200 gph pumps to drive several wells within the same system; anglers who live-bait for marl in often request installation of backup pumps, especially when supplying water to nma tubes. 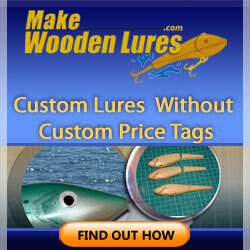 On its bay boats, Yellow-fin uses cartridge pùmps, wliich screw off and on and are made only for smaller vessels. Dedicated live-baiters can carry a spare pump and quickly sw-ap it if their original pump fails. 1 drain. That keeps the well completely 5 full so water and baits don't slosh. 5 which captain you ask. A clear lid or acrylic side win clow provides an easy-glimpse to check the health of the bait. But some captains like to keep their bails totally in the dark, claiming it calms them. Those captains paint their livewells black or dark blue, though light blue seems the most popular color today. Boatbuilders say those colors come from personal preference rather than any kind of scientific documentation. in dark or near-dark conditions. They also install spray bars for extra aeration and incorporate multiple wells in their hull designs for convenience as well as to allow- use of several incompatible bait species. "If the owner does a lot of tournament fishing and maybe lias threadfins and goggle-eyes, he'll want to separate the two," Torres says. "We also [Hit one in the front of the boat for guys who do a lot of kite fishing, TluiL keeps them from running from the back to (lie front of the boat all day,"
How to install live bait well? How to create a sand eel livewell tank? How to bridle live fish for sliding? 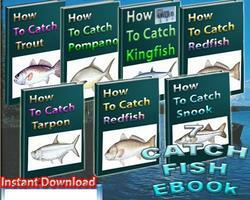 How to live bait a horse mackerel? How to hook a live poggy for strippers? 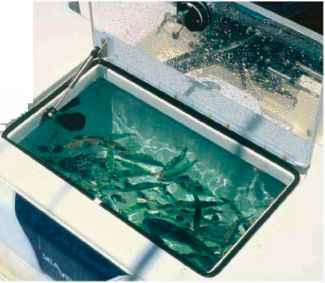 What is the most important thing with a live bait well? 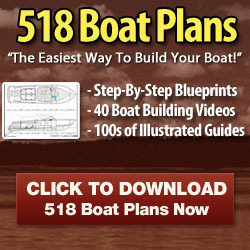 Where do the hoses go for live bait tank?